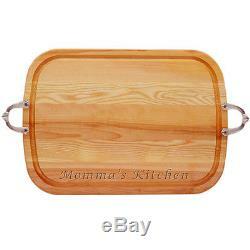 Everyday "Momma's Kitchen" Serving Tray with Urban Pewter Handles. Vermont made yellow birch and New England Ash. Country of Manufacture: United States. Overall Width - Side to Side: 21. Overall Depth - Front to Back: 15. Overall Height - Top to Bottom: 0.75. Overall Product Weight: 4 lbs. The item "Everyday Momma's Kitchen Serving Tray with Urban Pewter Handles" is in sale since Sunday, April 10, 2016. This item is in the category "Home & Garden\Kitchen, Dining & Bar\Dinnerware & Serving Dishes\Trays". The seller is "wayfair" and is located in Williston, Vermont. This item can be shipped to United States, to Canada, to United Kingdom, DK, RO, SK, BG, CZ, FI, HU, LV, LT, MT, EE, to Australia, GR, PT, CY, SI, to Japan, to China, SE, KR, ID, to Taiwan, ZA, to Belgium, to France, to Hong Kong, to Ireland, to Netherlands, PL, to Spain, to Italy, to Germany, to Austria, RU, IL, to Mexico, to New Zealand, PH, SG, to Switzerland, NO, SA, UA, AE, QA, KW, BH, HR, MY, BR, CL, CO, CR, DO, PA, TT, GT, SV, HN, JM.